Transistor 201 opens only for large signals, increasing floating diffusion capacitance to accomodate the larger charge. 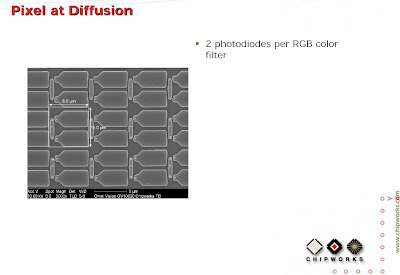 Omnivision's application US20080318358 talks about using indium doping for the photodiode pinning layer. Indium allows for a shallower implant layer with higher concentration than commonly used boron. An indium-boron combination is also applied for the patent. Potentially these filters can substitute today's organic ones. I wonder how far they have to go till the mass production. It's interesting to see Toshiba eying toward global shutter solution. It's nice to see that Toshiba still improves 2.2um generation. This paper sheds some light on Forza's customers and projects. 3D imagers becoming a field of quite intensive work. This very rare appearence of Omnivision pixel team should not be missed. 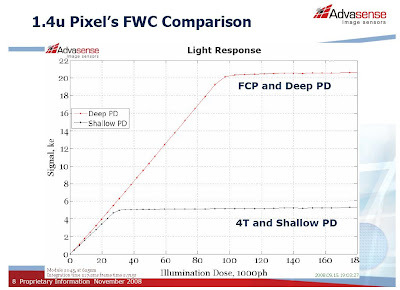 I don't know what is 2PFC, but if it really delivers better image at lower cost, we'll see Sharp among the image sensor leaders again. Bart Dierickx from Caeleste presented his 3D sensor ideas on IEEE Nuclear Scinece Symposium in Dresden, Germany, Sep. 2008. The presentation talks about the new design approaches in 3D world. 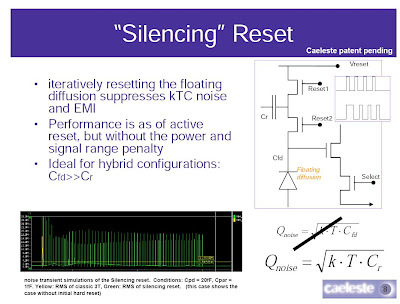 One might give up pinned photodiode and 4T CDS scheme and needs to look for other ways to suppress kTC noise. While we are at testing, Gamma Scientific offers calibrated digital light sources for image sensor testing in its Eigenlite RS-5 series. The sources can be used for photometric and radiometric calibrations and sensor's linearity tests. It came to my attention that Korea's HVS - HyVision System offers a full range of solutions for testing image sensors and camera modules, starting from simple PC add-on boards all the way to the automatic module production testers. Digitimes: TSMC has received few orders from OmniVision in December, which is a sign of the client's pessimistic outlook for the handset market in the first quarter of 2009, according to Digitimes sources. Yahoo: Micron reports relatively stable image sensor quarterly sales compared to the preceding quarter. The company’s gross margin on sales of Imaging products also remained stable compared to the previous quarter, reflecting a slight decrease in costs per part. On the sensor business it was flat and that’s unusually strong too in this environment, are you gaining share or is it that you’re not exposed to some of the markets where perhaps they’re seeing a lot more weakness then you saw. I think we did gain some share in the quarter but if you looked at some of the other forecasts and the competition, I think that’s indicative of what we’ll probably experience too. In other words I don’t think we’re going to escape the general economic decline and we would expect, and by the way its also the season of course is weaker, so we would expect for the what we call our Q2 or the calendar Q1 to be inline with what others are forecasting and it’ll be down for the quarter. The latest technical developments from Advasense Technologies Ltd.
Digitimes: Mediatek is expected to enter DSC processors market with an entry-level 7MP DSC chip solution in Q2 2009. Digitimes sources indicated that Mediatek initially will target DSC market in China by tapping white-box and local brands. EETimes: After many months of negotiations Panasonic acquired Sanyo for $9B. At some point Sanyo was the biggest CCD manufacturer for camera phones, but it was unable to switch over to CMOS sensors and lost its market share. Still, Sanyo produces a number of CCDs till now and has CCD-dedicated fab. The acquisition should strengthen Panasonic image sensor group. In a separate move Panasonic will absorb its wholly owned subsidiary Panasonic Semiconductor Device Solutions Co. Ltd. (PSCDS). PSCDS used to be responsible for the camera module business. The move is expected to take effect on April 1, 2009. Embedded Design India published Toshiba's article on choices and criteria in design of camera-phones (pdf is here). 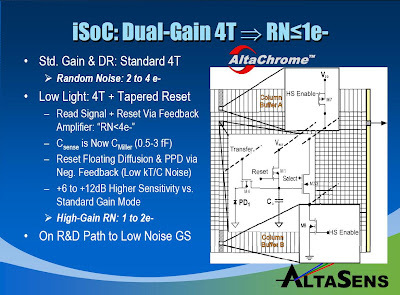 Tech-On published yet another report on IEDM presentation of Cu-In-Ga-Se image sensor by Rohm and AIST. The sensor has a layer structure composed of n-type ZnO, i-type ZnO, CdS, CIGS and Mo, which are arranged in this order from the top surface. The sensor is placed on a Si LSI via the molybdenum (Mo) layer serving as an electrode. The ZnO layer was formed using RF sputtering. The sensor works in avalanche multiplication mode. Venture Beat: Despite the investment freeze talk, Pixim raises $13M from Mayfield Fund, Ridgewood Capital and Tallwood Venture Capital. The company will use the money to accelerate its expansion in overseas markets, fuel new product development, and expand its marketing and sales programs. China is about 15% of its business, but Korea and Taiwan are also big markets, as are the U.S. and Europe. Customers include the biggest makers of security cameras: GE Security, Honeywell, JVC, Pelco, Dallmeier, and Siemens. Pixim has now raised $106.7M, including the latest round. There is only one image sensor in EDN's list of "The Hot 100 Electronic Products of 2008" and it's Kodak KAI-02150 CCD. What makes this 2/3" CCD different is its ability to provide 1080p HD video at 60fps speed. Congratulations, Kodak! 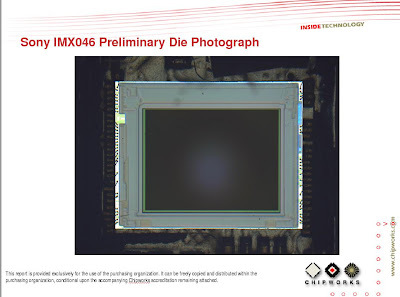 Yahoo: Dalsa presents its new 48MP 6um-pixel CCD for professional photography in a presentation at IEDM. Eric-Jan Manoury, a scientist at DALSA's Eindhoven R&D lab, gave the presentation titled "A 36x48mm2 48M-pixel CCD imager for professional DSC applications," highlighting the advances it delivers in increased QE, lower noise, and higher DR compared to previous generation or competitor devices. This is claimed to be the first large image format imager with high pixel rate of 100 MHz, 74 dB of DR and 55000e of full well capacity. The IEDM article is published on Dalsa site. 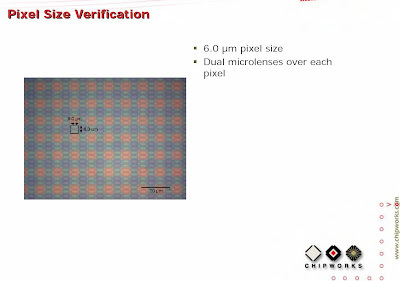 "Chipworks has been focusing on image sensors for a while now, so Rohm's announcement of a CIGS on CMOS sensor (paper 11.2) caught my attention. CIGS (copper indium gallium selenide) is one of the hot materials in the PV field, so the idea of using it for an image sensor is not that far off the wall -- the big problem has been high dark current. Rohm gets around this by using a double layer of zinc oxide as the top blanket electrode. One layer is semi-insulating ZnO, and the top sub-layer is Al-doped to give conductivity; this has the dual advantage of isolating the pixels and reducing dark current. The CIGS is co-evaporated on to a molybdenum base layer/back contact (which contacts the top metal layer of the CMOS scanning chip below), with a CdS buffer layer under the ZnO bi-layer. The pixels are 10μm × 10μm in a 352 × 288 array, so this is clearly a proof of concept. The sensitivity can be extended to sub-lux illumination levels by biasing the photodiode to induce avalanche multiplication. Since the photodiodes are on top of the die, they have an aperture ratio close to 100%, and this coupled with the CIGS spectral response extending into the near-infra-red makes the sensor suitable for automotive and security applications. In the same session Samsung compared 1.4μm frontside- and backside-illuminated (BSI) sensors (paper 11.4). Samsung claims that the technology will extend pixel size down to ~1μm." Earth Times: Due to the current economic slowdown, Toshiba plans to stop production for short periods at some of its fabs. One of the facilities affected is Oita operations, responsible for image sensors and SoC LSI production. The 300mm wafer lines will stop on January 5 and 6 for maintenance and other lines will stop for 22 days from December 24 to January 14. My understanding is that Toshiba image sensors are manufactured on 200mm lines (am I right? ), meaning they are to shut down for 22 days. Yahoo: OmniBSI has been selected by Electronic Design Magazine as the 2008 'Best Image Sensor Technology'. The publication's annual 'Best Electronic Design' awards are based on editor's choice of the most significant designs and innovations introduced throughout the year. OmniVision's BSI technology was selected for its revolutionary approach to digital imaging. Magnachip's application US20080296630 talks about applying negative bias voltage to transfer gate transistor during the integration. It looks like today everybody uses negative bias to reduce dark current. One possible problem here is increase in blooming and everybody solves it in its own way. Magnachip proposes a special burried channel for blooming current. This complicates the doping scheme of the transfer gate area, so I doubt that this idea finds a big use. Nokia camera team filed application US20080297816 on improved black level correction. They try to compensate black level gradients across the sensor array by measuring black level in many points on the periphery of the array and interpolating the results for all the pixels, doing it separately for each color. There is nothing unusual in the idea itself, other than it points out that the black level spatial variations is probably the real problem in the sensors that Nokia uses. Advasense put its Intertech-Pira Image Sensors 2008 Conference presentation on-line (the first one in the list here). 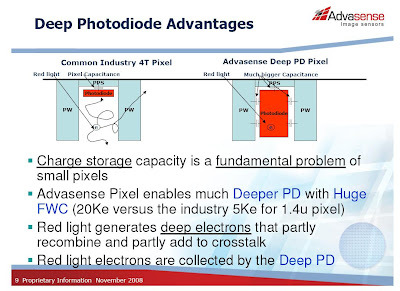 The main statement in the presentation is that modern small pixel sensors are not good in capturing image: in good light there is no enough full well capacity, while in low light there is no enough photons. 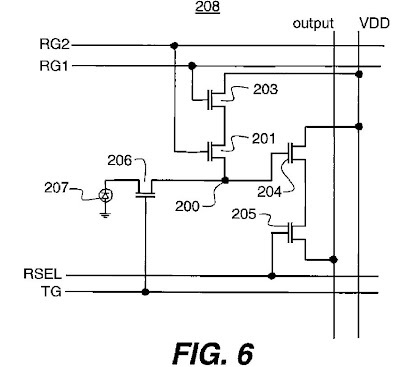 So, the company proposes its large full well photodiode as a solution for daylight, while an on-sensor embedded image stabilization is supposed to increase signal at low light. Thanks to A.G. for letting me know about the presentation. It looks to me that Omnivision used dual exposure technique to achieve its goal of 110db DR with this sensor. Two interleaved rolling shutters can run across the array, where reset curtain is followed by two read curtains - short and long one. Then the two readouts are combined into a single HDR image. Obviously, there should a large memory to hold the intermediate frame results. The die photograph in Chipworks document supports this guess, showing a huge memory-dominated digital portion. So, to me this looks like a dual exposure sensor with on-chip HDR reconstruction. Its main competition are Pixim digital pixel and Toshiba-like dual exposure pixels with charge skimming. In principle Pixim can get better dynamic range, but I believe Omnivision 4T pixel is better in low light, especially if two photodiodes operate in normal mode, with same exposure on the two photodiodes. Comparing it with Toshiba solution, I'm less sure about Omnivision advantages. Toshiba sensor might have some linearity artifacts when connecting short and long exposure ranges. Omnivision probably does not have this. However, Toshiba has an advantage in low-light sensitivity in HDR mode because Omnivision sensor effectively loses half of the light for the short exposured photodiode. One question that bothers me though, is that the two photodiodes are spacially shifted relative each other. So, there might be some color artifacts when interpolating the edges on HDR picture. It's probably not something fundamental, but might take some effort to correct. Many thanks to R.F. from Chipworks for providing this presentation! Yahoo: Robert W. Baird & Co. analyst Tristan Gerra told investors in Dec. 3 note that competition from "ultra-low-cost" rivals based in Asia is driving the company's revenue decline. Gerra added that OmniVision is likely to lose more market share next year as more mobile phone makers switch to higher-resolution sensors -- a market in which the company is not as well-positioned as competitors. So, it looks like Gerra does not count on Omnivision's BSI and EDoF success, which, in theory, could propel the company to the market leader position in high-res products. I wonder why he is that skeptical? EETimes: United Business Media Ltd., the publisher of EE Times, has acquired for at least $8M Sanguine Microelectronics, a semiconductor reverse engineering company based in Shanghai. UBM will merge Sanguine into its existing Semiconductor Insights (SI) group in Ottawa that provides chip and patent analysis services. The deal also includes possible payments of up to $9.5M to the Shanghai company over three years if the company meets unspecified business targets. The deal nearly double's SI's headcount and expands its lab capabilities. Sanguine employs about 130 people with a lab in Shanghai and an office in France and has annual revenues of about $4 million. SI has about 160 employees with labs in Ottawa and Warsaw and sales offices in Japan, Korea, Singapore, Taiwan, China, Europe and Israel. Both companies published a lot of reverse engineering reports on image sensors, albeit their recent focus seems to shift elsewhere. "The OmniVision OV10620 HDR sensor incorporates a unique split pixel design that operates using different exposure times to allow one part of the pixel to capture dark tones within an image, and the other part to capture bright tones. The two images are then merged using proprietary signal processing technology ensuring the visibility of entire scenes in high-contrast environments. The OV10620 is capable of performing at a dynamic range of up to 110dB in either color or black and white." Anybody can shed some light on this pixel work? Any published patents on it? Thanks to OA for bringing this to my attention. EETimes: Sony plans to slash about 8,000 jobs in its electronics business, or about 5 percent of its work force in the sector. The cutbacks involve its CMOS image sensor and other product areas. As part of the plan, Sony intends to cut IC investment expenditures this fiscal year by outsourcing a portion of its planned increase in the manufacturing of CMOS image sensors for use in mobile phones. Update: Official Sony PR is here. Yahoo: Aptina announced that it shipped one billion image sensors since it began manufacturing image sensors in 2002. Of the one billion sensors shipped, approximately 55 percent were megapixel or greater. Aptina maintains a product portfolio of over 70 CMOS image sensors. Yole's site I-Micronews published an interview with Youssef Benmokhtar, Marketing & Business Development Director on Nemotek, the first licensee of the full portfolio (SHELLCASE and OptiML) from Tessera. The company was established in September 2007 as a subsidiary of MEDZ (a Moroccan company with more than 1.2B$ of assets) as a Government initiative to position Morocco as a key player within the microelectronics industry and new sciences arena. Nemotek is claimed to be the only company in the world to date to offer a one-stop-shop approach for wafer-level cameras. I'm not sure if this idea works for small pixels, where pixel size is of close to wavelength. Also, I believe the process of creating such a surface is not simple. But I like fresh, out of the box thinking of Siliconfile engineers. 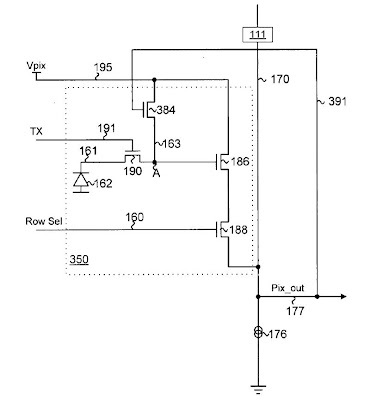 Application US20080291309 by University of Pennsylvania in Philadelphia talks about pixel with amplifier transistor, instead of source follower. The application is written in a scientific paper style, with good comparison of different techniques and their strong and weak points. While I don't like their idea and especially their proposed implementation, it's a good educational read. Chipworks got a hold of a Sony 1.4um 8MP IMX046 sensor in a commercially available product (probably from LG or Sony-Ericsson phone). The formal report announcement is prepared for next week. The die picture below reveals very compact sensor design. I hold my breath to see the full report available. Yahoo: Samsung announced that it has expanded its portfolio of CMOS image sensors to include a new high-definition 1/4-inch, 1.2MP SoC imager, the S5K4AW, for notebook and desktop computers. Instead of more usual 1.3MP, 1.2MP is better suited for HD video applications. By binning in 2x2 pixel groups, the S5K4AW’s 1.2Mp resolution (1280x960 pixel format) also can display standard VGA format without annoying problem of losing the top or the bottom of a scene while video conferencing or video file sharing on social media networks such as YouTube. 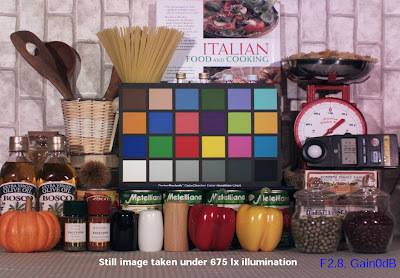 The binning technique used by Samsung’s new S5K4AW sensor for VGA resolution also significantly improves the imager’s sensitivity to low light. Samsung claims that the industry’s typical method of binning results in an improved sensitivity of approximately 1.2x - I'm not sure how they got this number. Samsung’s 2x2 binning shows a sensitivity improvement of nearly 3x. This is critical when the only illumination on the scene might be from the computer screen itself. The new S5K4AW imager is a 1/4-inch sensor that uses a 2.8um pixels. It supports 720p HD video at 30fps and VGA video at up to 60fps. Samsung is currently sampling S5K4AW sensor to select customers. Mass production is expected in the first half of 2009. Seeking Alpha publishes a transcript of Omnivision Q2 FY2009 Earnings Call. As many have expected, the guidance for the next quarter is down and the company forecasts an operating loss. Its strong cash position of $283M should help it survive and continue to invest in new technologies during the downturn, at least Shaw Hong, the CEO, believes so. He also tells that the company has already taken steps to reduce its operating expenses. Gross margin for the Q2 was 25% compared to 25.2% the previous quarter. Excluding stock-based compensation expense gross margin was 25.4% compared to 25.7% reported in the Q1. Omnivision continues its work to migrate to 300-millimeter wafer production, both with TSMC and VisEra. During our fiscal second quarter, we sold about 99 million units into the marketplace. Our 2-megapixel sensor shipments into smart phones have been particularly strong over the past two quarters. And now, this quarter, we have ramped up our 3-megapixel sensor shipments. just over 60% of our revenues came from the mobile phones and just under 40% from emerging products. As for the unit mix in the quarter, the VGA and below was 65%, 1.3-megapixel was just over 15%, and 2-megapixel and above was just below 20%. sensors on notebooks represented our strongest growth area during the quarter and represented approximately 30% of the company’s revenue. One of suspicious omissions in the conference call was absence of any word on BSI sensor volume production start, general sampling or design wins. No analyst asks about it in Q&A session either. This brings some food for thought. Correction: As written in comments, the earnings call does have a statement that two BSI products will be qualified for mass production in the first half of 2009. Mobile Handset Design Line publishes part 4 of Tessera mobile imaging challenges and solutions article. This part talks about image processing extensions to make cheaper and better camera modules, such as cheaper lens aberration correction, red eye removal and face detection features.